Last edited by silvanmelchior on Fri Apr 17, 2015 12:59 pm, edited 40 times in total. Very impressive work! I'm hoping this can be developed even further, but already I think something like this belongs as an option in the standard Raspbian distribution because it "just works" and so many alternatives just don't, at least for me. I followed the steps in your post and it took about an hour to do all the updates, upgrades and install. The mjpeg streaming does work better than any other streaming option I have tried. On my system here it is sometimes smooth and sometimes a little choppy, I presume due to my wifi link. No doubt wired ethernet would work better. When it is smooth, it looks just as good as the youtube demo on the other thread. The latency remains fairly low at about 0.4 seconds based on comparing an onscreen timer and the video image of it. This better than the various h264 format streaming that I have tried, where the latency sometimes starts low but then stretches out to 10s of seconds. When you click on the "record image" button, there is about 0.8 seconds delay before the actual image is captured, I presume the time it takes to switch the camera into full-frame mode. Since it is a full-frame still, it shows a wider field of view than the MJPEG preview which shows only the video area. I also see about that much delay between "record video start" and actual recording start. During a recording, the MJPEG preview sometimes freezes for about a second, but the actual mp4 video as saved is smooth without any glitches. While remotely viewing the 640x360 mjpeg image, the R-Pi reports 38% CPU for raspimjpeg and 16% for apache2. My R-Pi is not overclocked. While viewing MJPG, windows task manager says I am using 25% of my 54 Mbps wifi link, so that is a data rate of 13.5 Mbps. It's really nice to have the control panel with the control options to save stills and full-res mp4 file, I think many people are going to be using this! Note, in the secondary "preview.php" page under the "Download Videos and Images" link , I can view a preview of the JPEG stills fine, but the preview window for the mp4 video shows a grey rectangle with the text "No video with supported format and MIME type found". However I can still download the mp4 file and play it locally on my WinXP box, that part works OK.
Last edited by jbeale on Fri Dec 13, 2013 9:54 pm, edited 3 times in total. how to remove it? Or at least stopping the exclusive access of the cam? if you install as described in the first post, raspimjpeg will be running continuously, forever. To do anything else with the camera like raspistill or raspivid, you would first have to stop the process. Look for the PID of the 'raspimjpeg' process and kill it. If you do 'top' it will probably be the first one listed. I guess the point of this program is that you don't need raspistill/vid anymore, you can capture stills or video directly from the browser. Probably it is possible to add a button to the control window to stop and start the raspimjpeg process, for convenience. Well done website, by the way! Those are very nice images. I've now tried the RPi Cam Web Interface with raspimjpeg with browsers on my phone, a WinXP desktop, and a Lenovo 20326 Windows 8 tablet. Everything works OK with Firefox on desktop & tablet, and Opera Mobile on the Android phone. Chrome on both the tablet and desktop works for several minutes, then runs out of memory and crashes ("Aw, Snap! Something went wrong while displaying this webpage.") MS Internet Explorer doesn't really work at all on either device (gives flickering image, then goes blank, or freezes). I don't normally use Chrome or MSIE so maybe that's just how these browsers support, or don't support MJPEG. With Chrome 32.0.1700.41 it is either a memory leak or a garbage collector problem or similar. Looking at the task manager, the memory taken by one of the two "chrome.exe" tasks while the MJPEG page is open simply continues to grow at a steady rate, until it exceeds available memory and crashes around 2 GB. Looks like it is saving every single JPEG image displayed in process memory, forever. Firefox 25.0.1 actually starts out growing too, but then levels off around 500 MB. Update: here is a sample video, the 1080p version which was capture by the R-Pi showing the browser on a tablet displaying the MJPEG stream via the wifi link. You can get an idea of the lag, due to the video feedback effect. This looks very promising but is it possible to use the images the camera makes on a custom webpage, like with mjpg-streamer or something else ? I've got a spare RPi here and maybe I'm gonna test it on that one. andlinux wrote: This looks very promising but is it possible to use the images the camera makes on a custom webpage, like with mjpg-streamer or something else ? This is impressive, well done. I have the same experiences as jbeale with Chrome and IE. Works OK on the Android stock browser, although I only used it for a short while. My idea is also to add start/stop buttons, the --roi option and a possibility to use the full manual shutterspeed/ISO option without any of the default exposure modes. sudo tar -xvzf www.tar.gz -C .
@Honsolgen: If you want to free the camera just temporarily, run "sudo killall raspimjpeg" and to restart the service, run "sudo /etc/rc.local". Thank's a lot for all your great ideas on how to improve the web interface and add more features. 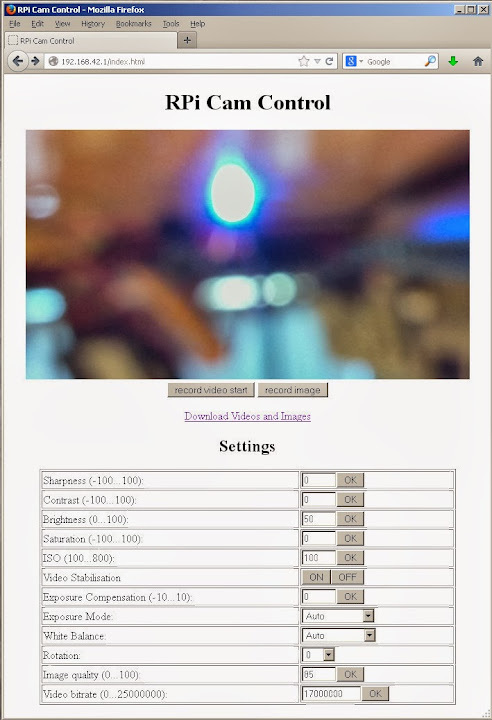 Unfortunately I won't have the time at the moment to implement them, because I created this interface for my next project: I want to add the RPi with cam to my quadcopter and record a lot of beautiful images and videos, controled from my smartphone browser. But if one of you finds the time, I would be grateful if you post your solution here! Last edited by silvanmelchior on Sun Dec 15, 2013 1:22 pm, edited 1 time in total. Brilliant!!! Thank you. I have been playing around with the Pi camera for a few days now, tried stuff from several sites, all with some success but never quite working as expected, but yours just works. Iceweasle 17.0.9 the video preview doesn't work but everything else is fine, Chromium Version 29.0.1547.57 Built on Debian 7.1, running on Debian 7.2 (217859) it all works, but it seems rather jerkier (is that a word?) than in Iceweasle. Motion detection to start video recording while motion is detected plus a short time afterwards. Videos recorded to a new file each time, with either a sequential file name or time/date based name. Time/date embedded into the video picture. With that I could set it up at the front of my house and in addition to the current live feed I could look at the video files and review the activity while I have been away. Great work - well done! Suggestion for future revision. How about a shutdown button. Where can I find the source code for this? I link this project very much, is there a chance that you'll share the code or give a manual to install all off this? Sniffers wrote: I link this project very much, is there a chance that you'll share the code or give a manual to install all off this? The rest of it for the web interface (html, php and js source) is in plain text files in your /var/www directory after you follow the install guide instructions in the first link. have this ENOSYS error with raspistill after rpi-update. only with noobs (light) install ... ( just now finished ) it works. Update: It's now possible to halt and restart the process from the website. So you can release the camera temporarily for raspistill/raspivid. To get the update, just run the installer again. After running the installer again Chrome doesn't use excessive memory any more, so that problem seems to be solved. I earlier followed the instructions with the tar archive, but that didn't help. I see the "release camera" button, but in Chrome (W7 64) it doesn't work, does nothing. Neither on my Android phone. It's installed and by the way it's very easy to install it. I tried different options like changing ISO, exposure etc. but I don't see any difference ? can this also write the images to /run/shm (ramdisk) ? Or what jbeale said in previous post about getting the html code but where can I find that page ? in /var/www (default apache2). Still looking to implement this on my other webpage. Last edited by andlinux on Mon Dec 16, 2013 4:37 pm, edited 1 time in total.